New Capital One Café, designed by world-renowned architecture firm, Gwynne Pugh Urban Studio, has opened in downtown Santa Monica. This popular destination is a place where people can meet socially, for business meetings, drink coffee and experience one-of-a-kind banking. 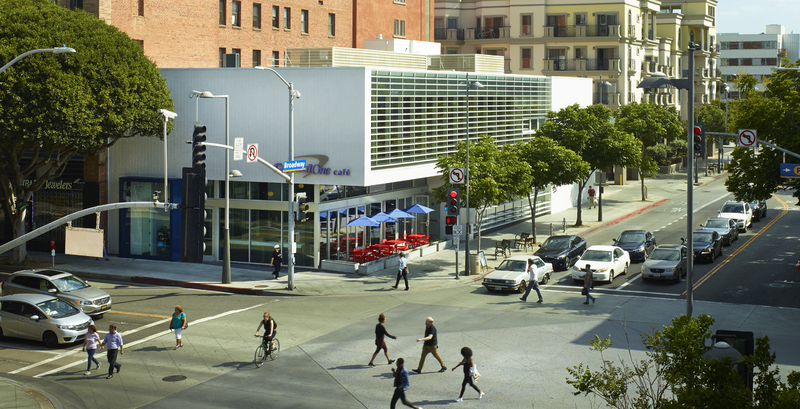 The concept driving the new Capital One Café in downtown Santa Monica is the idea of creating ‘a third place’ within an architecturally dynamic building. This is a destination, outside of people’s homes and workplaces where they can meet socially, for business meetings, drink coffee and experience one-of-a-kind banking. This more community-driven concept is reinforced by the design, which blends in seamlessly with its surroundings. The low-rise, 8,400 SF two-story building echoes the character of a mid-century bank while bringing a more modern design aesthetic. The structure was designed so that the corner was opened up and made into an indoor-outdoor space that responded to this busy downtown corner. The indoor-outdoor qualities are enhanced by the folding doors that open up the inside to the outside. The forms consist of folded planes that wrap down, fold back, then along and up. These planes are all made of glazed brick and smooth trowel plaster. The interstitial space is held together by horizontal louvers. These louvers shade the south facing glass. The interior is kept cool by the thermal mass and the shading of the glass. The interior, designed by IA Interior Architects, is open and light. A café serving Peet’s Coffee and locally-sourced pastries sits at one end of the lobby, with a variety of seating and communal workspace options dominating the bulk of the space. At the other end of the lobby is where visitors can find Capital One employees ready to help. Behind these employees are small rooms with sliding doors that can be used for private consultations, as well as conference rooms that can be reserved by non-profits and other organizations. Pugh has spent his career committed to the idea of architecture as a tool for placemaking and community-building, as evidenced by the multitude of projects he’s worked on in the immediate vicinity. Just down the street from the bank, at 5th Street & Colorado Ave., sit a pair of GP-US-designed hotels, which opened earlier this spring. The hotels sit adjacent to Step Up on Fifth, a non-profit housing complex serving people suffering from mental illness and homelessness, and across the street from Colorado Court, an affordable housing complex. This cluster of projects is representative of Gwynne’s longstanding relationship with the City of Santa Monica, in which he has lived and worked for over 35 years.